After a week of ear drops the gunk coming out of his Neko's ear has decreased to virtually nothing, which must be making a massive improvement in quality of life for him. The anti-inflammatory meds have also made a difference and he hasn't been worrying at the ear or crying/whining from the pain. We've agreed with the vet that continuing with all the medication for another week, then taking him in for an examination is the best way forward. Fingers crossed that the improvement I have seen in him externally is a reflection of what is going on internally. This gives me another 7 days to perfect the art of sneaking up on him while he is asleep, like some strange syringe wielding ninja, because getting ear drops into a 48Kg lump who doesn't want to co-operate is the very definition of "not fun". Neko went off to the vets again yesterday, a place he has come to recognise as somewhere people touch his ear, while the vet and I talked through how his condition had progressed Neko put himself in the corner and tried to do his best to blend in with the wall. He need not have worried because Mark the vet was happy to not attempt to look in his ear and the upshot of our conversation was that while it was certainly on the much improved, it was likely that Neko will need to have antibiotics on a on/off basis to control the infection for the rest of his life. This is mainly due to the fact that the infection is so deep inside the ear that it is almost impossible to eradicate without an operation to remove the entire inner ear, this isn't something that would be undertaken lightly given the size of the operation and the intense after care required. 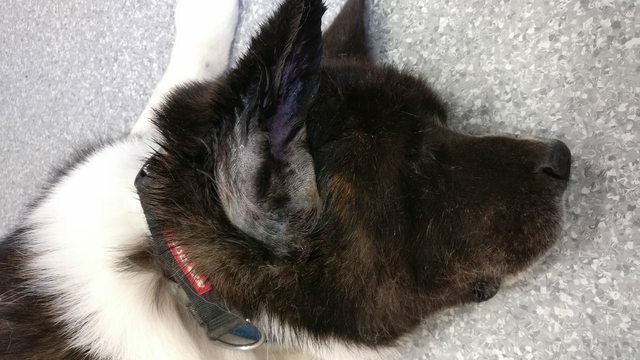 It's also likely that Neko will need to be permanently on an anti-inflamatory, both to help with the pain caused by the ear infection and his arthritic hips. The difference in his quality of life is very plain to see when he is on these, as I had run out of the supply he had been prescribed in the days prior to yesterday's vet visit. In those few days Neko's movements became much stiffer and it significantly slowed his walking pace, he usually lags behind a bit smelling a nice smell then trots to catch up and overtake to be in front for the next sniffing, without the medicine he was always behind and slowly plodding. 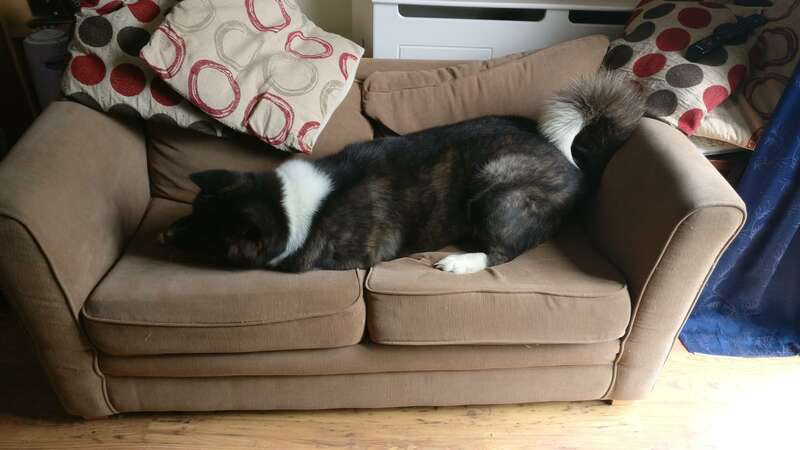 Like all big dogs, Neko doesn't think he is big. He thinks he is a small lapdog. 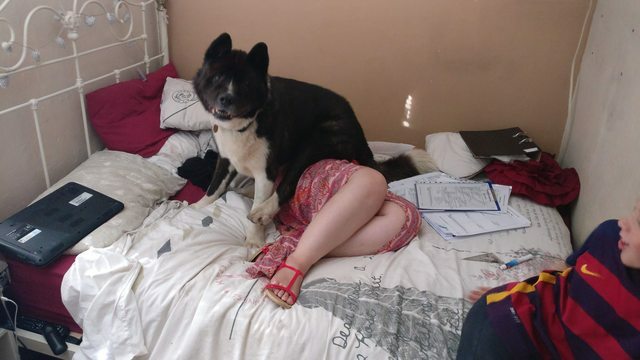 If you aren't prepared for it, you will find nearly 50Kg's of fur, dribble and love perched on top of you. As he has to be sedated for the cleaning I took the opportunity to grab before and after shots of it, I'll not link these as images directly viewable on the forum, because they aren't especially pleasant - Before and After - they give a fair impression of the state of his ear and how much the poor fella must have been suffering. For all of that he is the most laid back and gentle of dogs, even when we went into the vet and a medium sized poodle was barking almost right into his face he was just stoically watching while it calmed down. 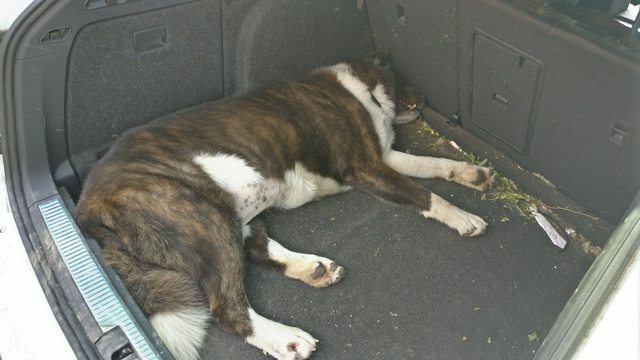 Still sleepy after the sedative, my car is an estate with a pretty huge boot, but Neko manages to make it look small! Thank you for looking after him so well, he's such a lovely, gentle boy. Neko and I had another journey around the M25 to the vets yesterday, I think he is starting to recognise this as he was very reluctant to get out of the car! Once we got inside and Neko was nicely sedated (this took two attempts and the vet compared it to sedating a rhino!) and sleepy we had the chance to get a look in his ear, again I'm not going to put the images of before and after as directly visible as they are still not very nice to look at. However what is very good news is that compared to after cleaning last week the infection has retreated from the foremost areas of the ear canal. I am not a vet, so I have no idea what that bit of the ear that is looking better is really called, so I'll go with "dangly bit", but I can say that what was cleaned out this time was a lot less than before. While he was sedated Neko had a big dose of steroids and antibiotics to help him fight the infection, we've also got some new oral antibiotics to try as the ones from last week gave him what I shall euphemistically refer to as "an upset tummy". As an antidote to the not so nice images above, here is Neko enjoying a treat and taking up my entire sofa. Oddly when he has a treat is the only time he even attempts to get up on it. EDIT: Google tells me that the bit of the ear is called the "antihelix", rather than the "dangly bit". Every day is a school day. Last edited by Robw on Thu Aug 30, 2018 5:48 pm, edited 2 times in total. 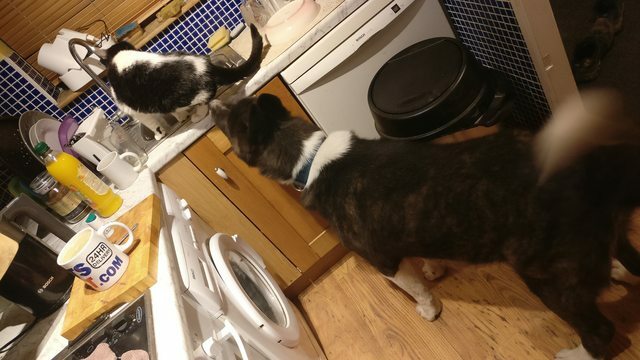 Neko has been wanting to sniff Alfie for ages, tonight he took his chance while Alfie was distracted. It's fair to say that the cat was less than impressed with the fact that he had been snuck up on by a large bear who was trying to sniff his bum, but Neko seemed to be content with the one smell and came away as soon as I told him to. Perhaps one smell was enough to put him off wanting any more to be honest, Alfie is much like my son - washes only happen if it is raining outside. Regardless, I think it's safe to say that with proper, careful introductions Neko is 100% fine with cats. Although he would prefer them to be cleaner. Neko has been struggling with his ear since he was found stray. Every week / or every other week our vets has need to address it under Gen An. On Tuesday Mark our senior vet decided he is going to remove the inner ear parts to clear the ulceration and give Neko a chance to heal. Its a long operation. We all thank Rob and Coco and Alfie and children for giving Neko fun times despite and facilitating his vet appointments involving long journeys. So now we pray Mark our vet can achieve a positive outcome.